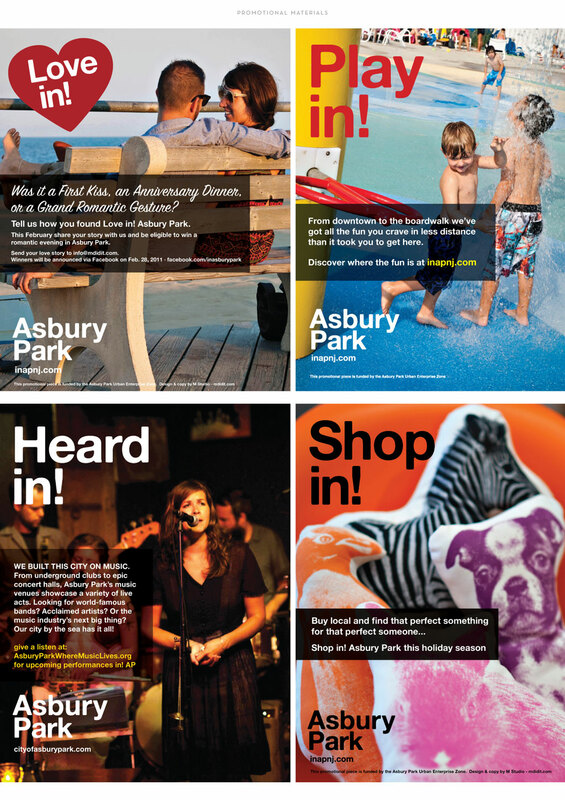 During the initial phase of its revitalization, The City of Asbury Park called on the branding strategies and communications skills of M studio to create a marketing campaign that spotlighted the city’s arts and entertainment scene along with its rich history, live-work opportunities, culinary resurgence, and re-developed boardwalk. With behind-the-scenes access to the city M studio calls home, we developed the “in!” campaign, an integrated marketing campaign that incorporated a branding system, logo and taglines, website design, content marketing, print and web-based advertising, social media, and traditional public relations. 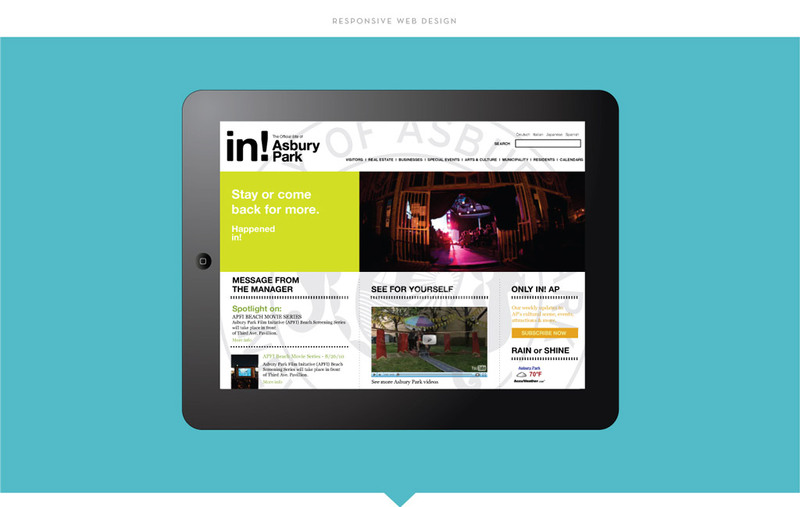 The “in!” campaign captured each of the city’s offerings and drove marketing efforts across platforms. Targeted audiences were invited to “Eat in!”, “Play in!”, “Live in! Asbury Park”, and more. As part of the campaign-driven branding system, M studio’s graphic designers developed annual city guides, branded marketing collateral, and advertisements, as well as a wallet-sized fold-out city map. The look and feel of the city’s website was designed and developed to be consistent with the overall branding of the campaign. To keep the city of Asbury Park top-of-mind, M studio’s public relations team updated the media of news and events, organized FAM trips, and worked directly with the business community to promote the city’s economic development. As part of these efforts, M studio’s PR team helped promote the city of Asbury Park as a host destination for the Smithsonian Institute’s traveling music exhibit, New Harmonies, earning it editorial coverage in the Associated Press, USA Today, The New York Times, and more. Similarly, media was garnered in travel and lifestyle publications including the in-flight magazine American Way. Branded messaging using the “in! Asbury Park” campaign was promoted across social media platforms including the city’s Facebook and Twitter accounts. Strategies to build an audience and increase engagement included a summer beach-badge promotion and Valentine’s Day Getaway contest that contributed to the growth of the city’s database of loyal followers.